Author contributions: All the authors contributed equally to this manuscript. AIM: To assess our management of patients suffering from missile injuries to the maxillofacial region. METHODS: From December 2009 to September 2012, 40 patients with missile injuries (high velocity gunshot and bullet wounds, explosive injuries and shrapnel etc.) affecting the maxillofacial region were treated. All except for 2 patients were males. All had soft tissue injuries with or without bone injuries. These patients were referred to the plastic and maxillofacial surgery ward of our hospital. The patients were 19 to 65 years of age (mean 45 years). In 19 cases, there were missile injuries to other parts of the body, especially the lower extremities. All of the patients were managed by early soft tissue debridement, comprehensive reconstruction and antibiotics. This retrospective study was approved by the IRB and ethical committees. RESULTS: The majority of injuries were caused by high velocity projectiles (88%) and the remaining by car explosions or dynamite blasts (12%). 40 patients were treated surgically. Thirty patients had soft tissue loss (75%) and 20 patients (50%) had bone loss; there was combined soft tissue and bone loss in 10 (25%) patients. Facial fractures were in the orbital bones in 10 cases, maxillary in 7, nasal in 5 and the mandible in 3 cases. We used primary repair in the majority of soft tissue defects (25 of 40 cases). Bone repair was done primarily at the same stage using miniplates, titanium screws or wires. In some cases with a bone defect, iliac bone grafts were used simultaneously or in the later stages (mandibular defects). There was no failure of bone reconstruction in our cases. Infections occurred in two cases and were treated with systemic antibiotics and dressing changes, without any long term sequelae. CONCLUSION: Our principles for soft tissue reconstructions were according to the reconstructive ladder and included primary repair, local flaps, skin grafts and regional flaps depending on the extent of damage. Primary repair in facial missile defects was not associated with increased morbidity or complications in this series. We recommend this approach when feasible. Core tip: Exposure to missile injuries may result in unique and complex injury patterns from projectiles or fragments. Injuries to the face due to firearms are either high velocity or low energy; high velocity projectiles can result in devastating functional and aesthetic consequences, shattering the hard tissues. 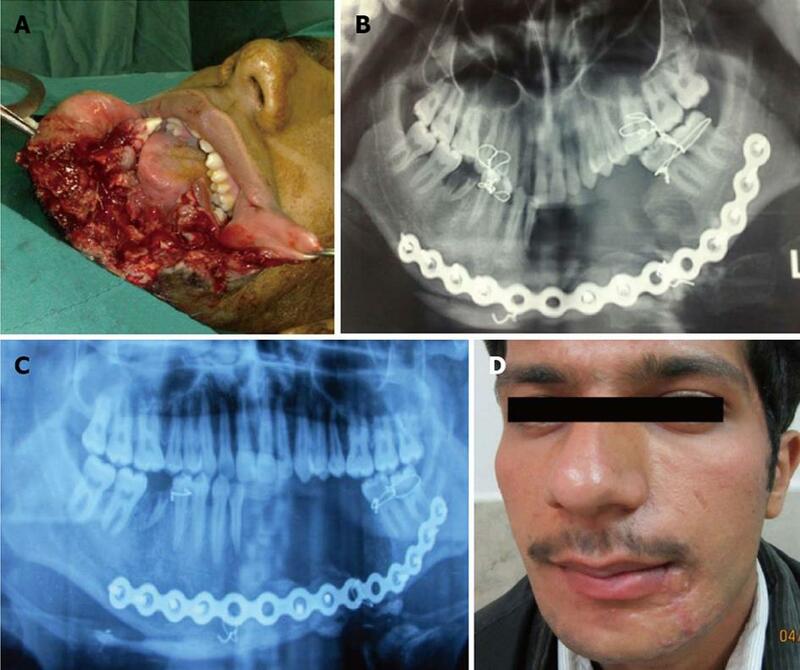 Early intervention in facial firearm injuries resulted in restoration of occlusion and continuity of the jaw, fixation of luxated or extruded teeth, early return of function, prevention of segment displacement and tissue contracture, less scarring and decreased need for major bone graft reconstruction later on. Missile injuries to the maxillofacial region are important health issues, both in the military and civilian population. The range of damage of these injuries represents a continuum of severity from minor injuries to those resulting in lost workdays, long-term disability and fatalities . We managed such patients after primary urgent management at our hospital. The principles of treating blunt trauma to the face are well established; however, missile injuries in this region have special features that provide the surgeon with multiple medical and surgical challenges when dealing with these injuries. The severity of these injuries depends upon many factors, including the type of missile and type and site of the injury; damage to the tissue is much more a function of the velocity of the missile than of its mass. The most important factor in the care of patients with a missile injury is the initial assessment and resuscitation performed at the emergency department. The management of missile injuries of the maxillofacial region can be divided into three phases: immediate, intermediate and late. Indeed, most plastic and maxillofacial surgeons manage patients in the intermediate and late phases but require cooperation between the emergency physician and maxillofacial surgeon for optimal and early management. Controversy exists regarding early aggressive intervention or a more conservative approach. In this article, we review facial reconstruction after missile injuries with early surgical intervention. Forty patients with missile injuries (high velocity gunshot wounds, explosive injuries) affecting the maxillofacial region were included in this retrospective study within the period from December 2009 to September 2012 consecutively. These patients were referred to the plastic and maxillofacial surgery ward of our hospital; 38 patients were men and 2 were women, with an age range of 19 to 65 years (mean 45 years). All patients had combined soft tissue with or without bone injuries in the facial region (Figure 1). In 19 cases, there were missile injuries to other parts of the body, especially the lower extremities. We managed all patients with early soft tissue debridement and reconstruction and placed them on antibiotics for one week after primary surgery. This study was approved by the IRB and ethical committee. Figure 1 A 20-year old man with a gunshot wound to the lower face, with disruption of soft tissue and the mandible bone in body with bone defect. A: Before operation; B: Computed tomography scan before operation; C: Reconstruction with reconstructive plate; D: Three months post operation. Our principles of reconstruction of the facial soft tissues were by primary intention, including primary repair, local flaps and regional flaps such as cervicofacial flaps. In periorbital wounds, the orbit and globe were examined carefully for detection of injuries and we requested an ophthalmologist consultation for such patients (Figures 2 and 3). In three cases of gunshot injury with unilateral blindness, globe enucleation was done. 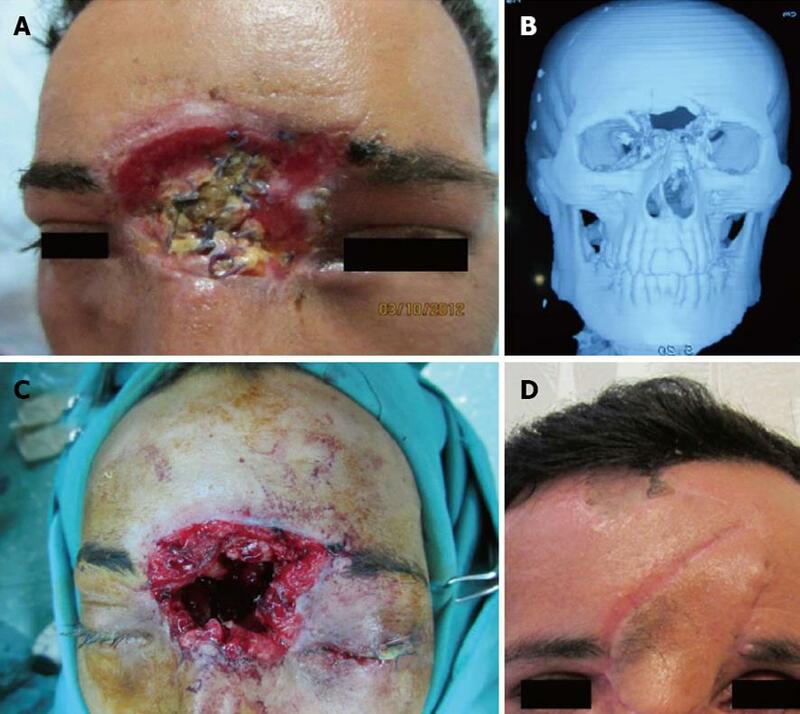 Figure 2 A 30-year old man with a gunshot wound to the upper face, with disruption of the forehead and frontal and ethmoid sinus and left eye to the base of the skull. A: Before operation; B: The patient was treated with abdominal fat to obliterate the frontal sinus elsewhere before referral. Computed tomography scan before reconstruction; C: Intra operative view; D: Reconstruction with forehead flap and iliac bone graft (one month post operation). Figure 3 A 23-year old man with a gunshot wound defect of the eyebrow. A: Before operation; B: Early post operation; C: One year post operation. Shell fragments, bullets and shrapnel were removed if they were in the field of operation; otherwise they were left. For bone reconstruction, we restored shape, contour rigidity and stability to the facial skeleton with different devices, such as titanium screw and plate, wire and arch bar immobilization with or without bone grafts (Figure 1). Our method for bone grafting was in the early phase from the iliac crest. For treatment of gunshot wounds of the mandible, we used an intraoral or extraoral approach and open reduction and internal fixation with miniplates or reconstruction plates, with or without intermaxillary fixation. In one case, we used a reconstruction plate (Figure 1) and in a later stage iliac bone grafting was done. For treatment of gunshot wounds of the maxilla, we used intraoral incision and open reduction and internal fixation with miniplates with or without intermaxillary fixation. For treatment of gunshot wounds of the frontal bone, we used an open approach from the laceration site or coronal incision and, after reduction, internal fixation with miniplates with or without bone graft was done. All periorbital fractures were operated on during the first week after injury. Upon admission of injured patients, examinations were done as indicated (radiography, axial and coronal facial CT scans, Doppler ultrasound for carotid artery damage). For treatment of gunshot wounds of the orbit, we used an open approach with reduction and internal fixation with miniplates and screws, with or without an implant. All deformities and scar contractures were corrected after maturation of scars. Ophthalmic injuries were diagnosed in 10 patients (globe, eyelid and eyebrow). Enucleation of the unilateral eye was done in 3 cases by the ophthalmologist for severely damaged and complete blindness of the unilateral eye. We used primary repair in the majority of soft tissue defects (25 of 40 cases). Bone repair was done primarily at the same stage using miniplates, titanium screws or wires. In some cases with a bone defect, iliac bone grafts were used simultaneously or in the later stages (mandibular defects). A total of 40 patients were treated and followed from 5 months to 3 years. There were 38 male and 2 female patients, with an average age of 37 years (range 19-65 years). Most injuries were caused by high velocity projectiles (88%) and the remaining by car explosions or dynamite (12%). Thirty patients had soft tissue loss (75%) and 20 patients (50%) had bone loss; there was combined soft tissue and bone loss in 10 (25%) patients. Facial fractures were in the orbital bones in 10 cases, maxillary in 7, nasal in 5 and the mandible in 3 cases (Table 1). Table 1 Distribution of facial soft tissue and bone damage in 40 gunshots and blast injured persons. There was no failure of bone reconstruction in our cases. Infections occurred in 2 cases and were treated with systemic antibiotics and dressing changes, without any long term sequelae. Exposure to missile injuries may result in a unique and complex injury pattern, usually from fragments or bullet wounds which are often fatal if they involve the head. Blast overpressure is the abrupt, rapid rise in atmospheric pressure resulting from explosive detonation, firing of large caliber weapons and accident occupational explosions[4,5]. There are two schools of thought for the management of such patients subjected to missile injuries: early intervention and nonaggressive conservative intervention. Injuries to the face due to firearms are either high velocity or low energy; high velocity projectiles can result in devastating functional and aesthetic consequences, shattering the hard tissues. Our principles for soft tissue reconstructions were according to the reconstructive ladder, including primary repair, local flaps, skin grafts and regional flaps depending on the extent of damage (Figure 3). We used primary repair in the majority of soft tissue defects (25 of 30 cases) and recommend this approach for these injuries. We used surgical intervention in all cases. Early intervention in facial firearm injuries resulted in restoration of occlusion and continuity of the jaw, fixation of luxated or extruded teeth, early return of function, prevention of segment displacement and tissue contracture, less scarring and decreased need for major bone graft reconstruction later in one study. If continuity of the mandible can be obtained, in the subsequent operations there will be no need for maxillomandibular fixation. In this case series study, we had no major complications after early surgical interventions. All facial wounds were under systemic antibiotic therapy for one week and local antibiotic ointment to prevent secondary infections. There was no failure of bone reconstruction; in our cases, maxillary defects were reconstructed with bicortical bone grafts in the same operation. We had facial wound infections postoperatively in 2 cases and treated them with systemic antibiotics and dressing changes, without any long term sequelae (these two patients had a mandible fracture with a through wound of the oral cavity without any medical immunocompromising factors). The issue of when to treat maxillofacial firearm injuries remains controversial (early or delayed), although not all maxillofacial projectile injuries can be comprehensively treated at the onset. Although all missile wounds are contaminated, the general consensus in the medical literature and textbooks consider these infections to be mostly of odontogenic origin. In composite defects (soft tissue and bone), we used bone graft and soft tissue flaps simultaneously for coverage of bone and our results were free of any significant resorption or flap necrosis after early operative intervention. In our study, the most common site of entrance and exit wounds was in the cheek (67%). In another study in Iraq by Kummona, the most common site was also in the cheek (54.8%). According to our results, the midface is a common site for gunshot injuries and a safe coverage for protection of the cheek in military and civilian people must be designed for combat. The face is the part of the body most subjected to injuries, either by road traffic accidents or missile war injuries. In our experience, gunshot injuries of the craniofacial region are not a single site injury and often have associated injuries; thus, a complete evaluation of soft tissue and bones must be done for all patients. We used free bone grafting for 4 patients in our cases and the preferred site for bone graft harvesting was the iliac crest because of combined corticocancellous block of bone. For delayed reconstruction of the frontal cranium, we used titanium mesh and soft tissue flap with acceptable results (Figure 3) and without any complications. In our series, the most common associated injuries were ophthalmic injuries (Table 2), seen in 10 patients with unilateral blindness. In another study, the most common injured facial structure was the facial nerve and the second most common was ophthalmic injuries. An important problem in patients with gunshot injuries or blast damage is facial burn blast tattoos that must be managed early post damage by operative intervention. Application of silver sulfadiazine before the operative intervention helps to remove embedded particles better and decrease traumatic tattoos. This procedure is also better to be done early. Advocates of primary management have supported this viewpoint[11-14]. Table 2 Associated injures in the face n (%). In high velocity gunshot and blast injuries with facial damage to soft tissue and bone, early surgical intervention is beneficial and good results without significant complications can be obtained; we recommend this approach in these types of facial injuries. Firearm projectiles can result in devastating functional and aesthetic consequences, shattering the hard tissues. Early intervention in facial firearm injuries is still in debate. Experience has shown that early management results in restoration of occlusion and continuity of the jaw, fixation of luxated or extruded teeth, early return of function, prevention of segment displacement and tissue contracture, less scarring and decreased need for major bone graft reconstruction later on. Innovations in surgical instruments and hardware, plates and screws have enabled rigid fixation of fractures. These advancements have enabled surgeons to better manage gunshot injuries. The manuscript is a result of good efforts on the part of the authors and may be useful to determine management of maxillofacial injuries secondary to missiles and gunshot wounds.